Weyerbacher has long caught our eye when it comes to beer despite the subpar labels on the bottles. From our very first sip of Double Simcoe IPA, we grew ever eager to try more from this brewery. Many have dominated our taste buds (Heresy, Blasphemy and Imperial Pumpkin Ale to name a few) so we were excited that these kind brewers would bless us with yet another beverage. 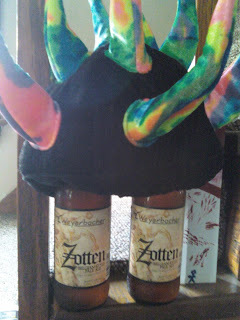 Weyerbacher's newest creation, Zotten, is a Belgian Pale Ale. At 6%, this "session beer" still beats any of the ice domestics you can get at your local NE Ohio grocery in ABV. Zotten, Belgian for "joker," pours a clear amber color with a Belgian Ale style smell and frothy white head. The brew has a creamier taste than what the label promises with hops hidden beneath its classic Belgian fruit flavor. The brew flows freely down the throat making it incredibly drinkable given the style. I didn't see the Zotten up there, I must go to lena's.